"This recipe is incredibly simple to make, and it's fat-free, yet these are the most delicious beans I've had. The secret ingredient is the salt-preserved lemon, a flavor like no other. Serve hot in small bowls as a side dish or snack. Good with eggs, tortillas, or other Mexican food. Leftovers keep well in the refrigerator." 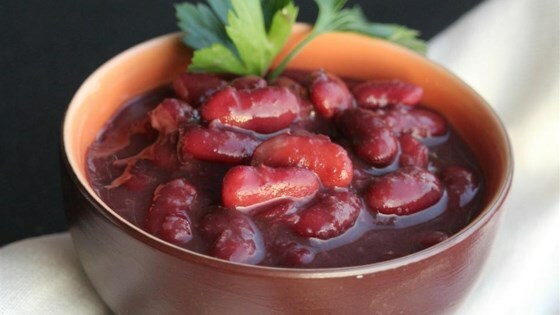 Place kidney beans into a large container and cover with about 1 quart water; let stand 8 hours to overnight. Drain. Combine beans, 1 quart water, preserved lemon, sugar, black pepper, red chile pepper, bay leaf, garlic powder, and anise seed in a stockpot; bring to a boil. Reduce heat to low, cover stockpot, and simmer for 1 hour. Remove lemon, bay leaf, and red chile pepper from bean mixture. Mash about 10% of the beans against the sides of the stockpot using the back of a spoon. Cover stockpot and simmer for 45 minutes more. Remove cover from stockpot and simmer beans until beans are thickened and water is evaporated, about 15 minutes more. See how to make super quick-and-easy baked beans. Use dry beans, not canned. Amazingly cheap, they have a much better texture and more flavor. The preserved lemon piece is notably better than fresh lemon. Keep them on hand: they are very very simple to make, and a wonderful seasoning for many dishes. If you must, substitute fresh whole lemon plus 1 teaspoon salt. The nutrition data for this recipe includes the full amount of the sodium from the preserved lemon. The actual amount consumed will vary.